Cosonok's IT Blog: Why I Use CLI and Why NetApp Clustered ONTAP is Awesome! Why I Use CLI and Why NetApp Clustered ONTAP is Awesome! A lot of the posts on this blog use CLI commands, very few use the GUI, and I wonder if some readers reading this blog, look at the posts and think “that looks complicated.” Well, the truth is that it is all very simple, and I hope I present things simply and straight to the point without waffling on unnecessarily (this post is a bit of an exception, one of my rare waffle posts.) CLI is like a language but much easier (easy tab completion, and the use of “?”, don’t exist in any verbal language I know of), and if every language was as easy as Clustered ONTAP, then I’d surely have mastered conversational language skills in more languages than just my native tongue. 1) Much easier, quicker, and more efficient, to document CLI commands than take innumerable screenshots of pointing at things in a GUI. 2) I like using the CLI - its good fun! Learning the CLI is a must do for the serious IT Professional. It is very easy in small environments to get away with just using GUIs, but as things scale, it becomes a massive benefit, almost a necessity, to get a grasp of the CLI. Like a spoken language, with practice, CLI becomes second nature. And there are also reasons why IT Professionals prefer CLI, such as precision: it’s always very precise in that you know exactly what’s going on - you type a command and the command is processed - versus when you click on the GUI and you’re never quite sure what magic is going on in the background. Microsoft’s Server Operating Systems and Application Servers have moved more and more towards having powerful CLIs, and for good reason: for more efficient administration and increased automation - especially for large Enterprise systems. Cisco Network Professionals have traditionally always used CLI. And of course anyone from a UNIX/Linux - “a proper operating system (with no Windows GUI)”* - background has been brought up using the CLI. Now I come to my titular comment of “Why NetApp Clustered ONTAP is Awesome!” Well, I’m not a salesman, never have been, and never will be, so I’m not trying to sell you anything here. And there are many reasons why Clustered ONTAP is awesome - such as it’s taken the most highly featured and flexible storage operating system in the world (Data ONTAP) and enhanced it by making it cluster-able, thus removing the need to manage things at a storage controller level, and massively improving on the already very popular CLI - but here I’m just going to focus on one point. What can I manage from one powerful CLI session? From one very powerful but simple to use CLI session (tab completion makes life very easy and “?” is your friend in the CLI), I can manage up to nearly 70PB of raw storage capacity! 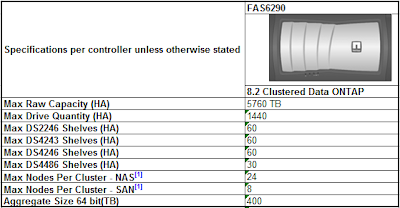 From the NetApp Hardware Universe (http://hwu.netapp.com/Controller/Index), the current top of the range NetApp FAS series controller, the FAS6290, has a max raw capacity of 5760TB per HA-pair. 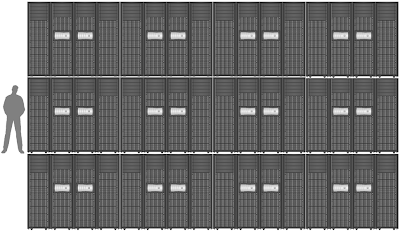 Now, Clustered ONTAP can have up to 24 nodes or 12 HA-Pairs, and 5760TB x 12 is nearly 70PB. 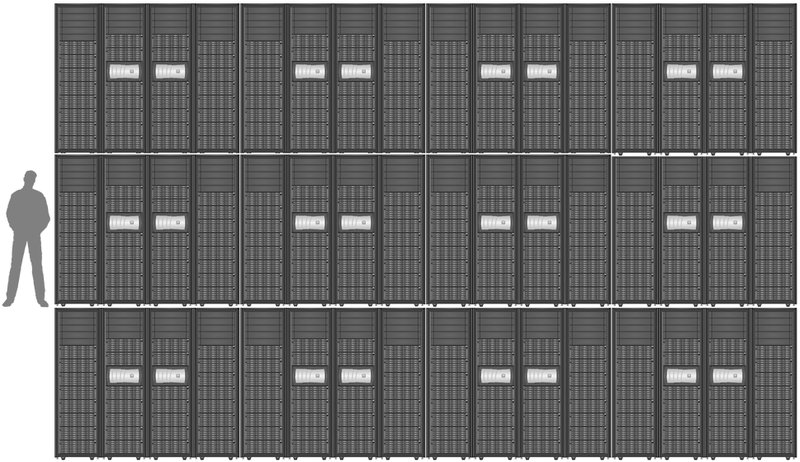 And what would 70PB served by 12 HA-Pairs of FAS6290 look like using the high density DS4486 shelves with 4TB drives (that’s 192TB in a 4U shelf)? Image: 70PB Clustered ONTAP 24-Node NAS Storage Cluster on DS4486 with 4TB drives and one storage admin! One CLI session controlling 24 nodes!